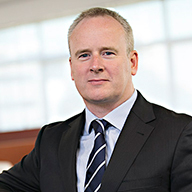 Kevin Gallagher is the Head of Financial and Risk, Africa for Thomson Reuters, based in Johannesburg. He is responsible for the strategy, sales, service and growth of the Financial and Risk business across sub-Saharan Africa as well as the identification and development of local talent within the organization. Since joining Thomson Reuters in 1996, Kevin has led high performing Sales teams across several parts of the Financial businesses in both Europe and USA before moving to South Africa in 2008. In Africa he has been instrumental in the successful integration of the Thomson and Reuters businesses and in the past few years has led the Sales efforts across the region building a strong client focused team Prior to joining Thomson Reuters, he was an analyst at the Financial Times and also had a regular monthly column in IFR/World Equity magazine on Global Equity trends. Kevin has a BA in Economics & Mathematics from University College Cork in Ireland.